Thank you, Troy Mayhew, for finding this incredibly inspiring article. I believe it will take quite a long time for Jacksonville to come around, but anything worth doing and doing right, takes time, patience, and a raging river of good humor. Are ya with me, Jax?! 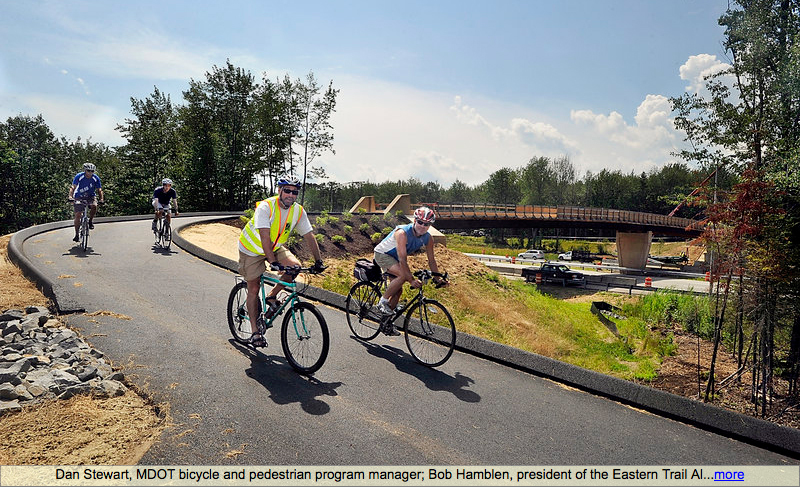 Mile by mile, bridge by bridge, Eastern Trail supporters are closing in on their goal. In 1997, all John Andrews wanted his Saco Bay Trails volunteers to build was a trail from Scarborough to Saco — a pathway through three towns. A town officer told him he’d never get a bridge over Route 1, and support for the trail seemed minimal. In December, Andrews and people from eight towns will celebrate the 21 miles of linear off-road bicycle and pedestrian trail they’ve built between South Portland and Kennebunk — and the opening of not only the Eastern Trail’s bridge over Route 1 but also another spanning the width of Interstate 95. In recent years, the vision of an off-road trail running the length of southern Maine has come closer to a reality as others have joined and worked alongside Andrews on the Eastern Trail. This year, with an unprecedented number of off-road miles built on the unique path, those involved say there’s no stopping now. The Eastern Trail Alliance was incorporated in 1999 with the goal of building a 55-mile off-road trail from Kittery to Casco Bay. It started with Andrews, but others in towns along the trail soon joined and stayed on. Now Hamblen puts in eight hours a week on the trail. Five years ago, he said progress on the trail was unlikely to move fast. Today Hamblen is getting ready to celebrate one of the Eastern Trail’s biggest showpieces: a bridge over busy Route 1, paid for with the help of a $500,000 bond approved by his town’s voters in 2007. “It will be a billboard,” Hamblen said proudly. Meanwhile, the Eastern Trail bridge over I-95 that will open soon will have all the power of social media. It may be used daily only by cyclists in Kennebunk, Arundel and Biddeford, but it will be seen by thousands of motorists, commuters and tourists coming to Maine. 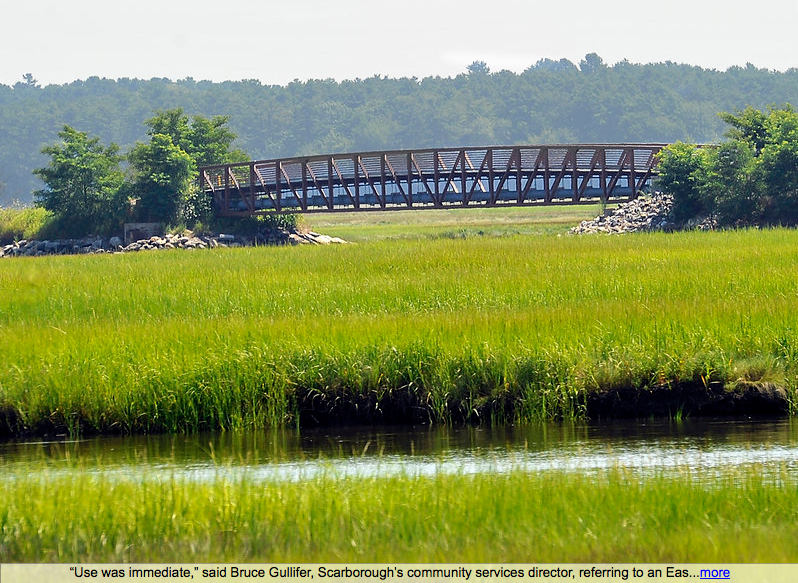 When Dan Stewart took over as the bike and pedestrian coordinator at the Maine Department of Transportation six years ago, only a few miles of the trail had been built across the Scarborough Marsh. Some $10 million later, there will be 21 miles completed by the end of this year — with nearly a fourth of it is getting built in 2011. • South Portland will extend its trail at Wainwright Field Sports Complex to the Scarborough line, a $200,000 project to finish paving 0.3 miles. • The Old Orchard Beach section will expand 4.37 miles into Saco and run over Route 1. • The 5.7 miles stretching from Biddeford to the Kennebunk town line will be expanded to 6.2 miles with the new turnpike bridge. Yet none of those working on the Eastern Trail today thought a decade ago that the trail would be where it is. Gullifer is the one member of the 11-town Eastern Trail Management District well versed in the use the trail gets. He said the number of people who come to walk the seven-year-old section over the Scarborough Marsh is staggering. Now Scarborough is working on a $150,000 engineering study to get over the Nonesuch River. Then there is the job of getting around the Amtrak tracks in Scarborough, a roughly $3 million project. This section is the part of the trail everyone calls the critical gap, connecting the most developed parts of Maine with a trail that runs through woods, fields and over marshland. When the gap is closed, a full 16 miles of contiguous trail will span from Saco through four population centers to Casco Bay. The MDOT funds just $8 million of the state’s $36 million requests for trail projects every two years, and Stewart thinks it will get built. “It is one of the most, if not the most, critical gap sections in the state of Maine,” he said. Only one person working on the Eastern Trail does not think about this important connection or the difference it could make in the way people commute. John Andrews, as always, is already 20 miles down the road, looking 10 years out. At 74, the retired engineer is still an avid cyclist, but no longer a patient one. The second half of the trail is all he thinks about now. So when the members of the Eastern Trail celebrate next month at the opening of the I-95 pedestrian and bicycle bridge, Andrews will be standing over the interstate looking south.